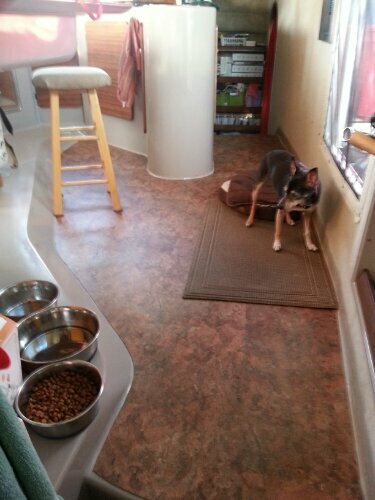 Once upon a time (almost two years ago) the Becks decided to replace the main galley floor that came with Tango when we bought her. 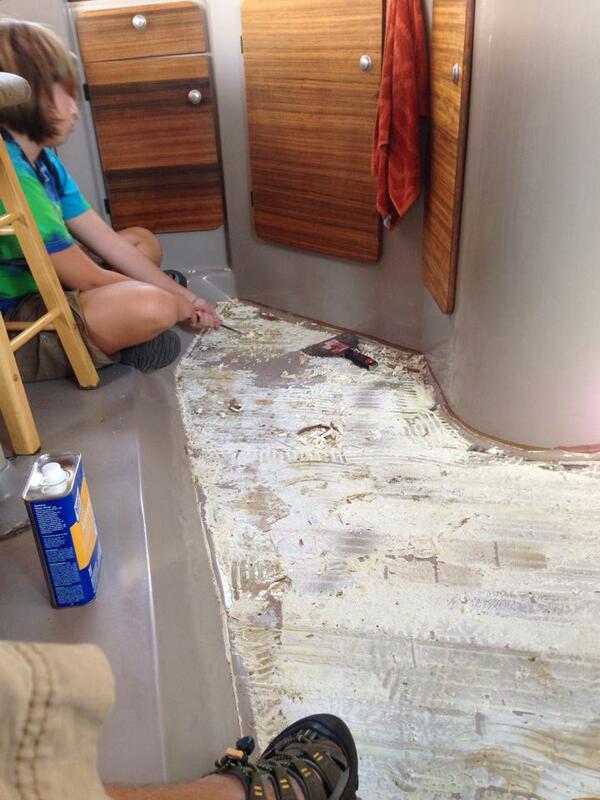 The vinyl flooring was peeling, stinky, and ripped so it had to go. We decided to be all fancy and what-not, and put in teak planking. The teak was really beautiful, as you can see. 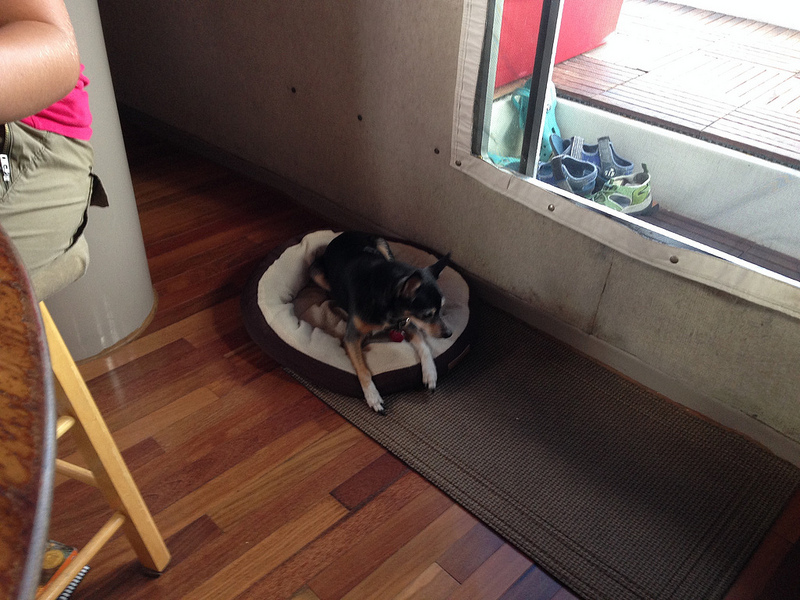 BUT, our elderly dog (Banyan will be 18 years old in a month) has become incontinent in his old age. It’s not his fault as he’s been boat broken for many, many years. His prostate (or whatever boy dogs have) just can’t take it any more. For the last year he’s begun having the occasional accident. It just happened that he found a spot where the sealant between teak boards wasn’t complete and over time he managed to soak the underside of the planks with his old man pee. Boy dog diapers work really well at night, but with his bad back he can’t really walk in them…so we put up with the pee and thought we were cleaning it up…for a while. One spot slowly started to warp and we realized that we had a bigger problem. This weekend we got some cheap vinyl squares from Home Depot and laid down a test area on one stair step. Everyone declared that it looked wonderful, so the great weekend floor replacement commenced. The teak came up easily…just a confirmation that we were doing a good thing. Every time Banyan complained about not being able to walk around the boat freely we reminded him that this was his fault. It was nice to get the floor really clean. The hard part was the glue. It did its job really well…until Andy bought a hand sander and attacked it with gusto. Take that glue! Sunday afternoon we had all the vinyl cut and laid…we’ll see how long this floor lasts!